They are just handbags: rows and rows of handbags, 100 to be exact. They are black and all the same shape, size, and design. There is more to them of course. They are all copies of the famous Asprey Handbag used by former Prime Minister Margaret Thatcher. The original one sold at Christie’s for 25,000 pounds with proceeds given to charity. All of the handbags, including Ms. Thatcher’s, was made in Marikina the Philippines. The artist Pio Abad is from the same city where they were made but moved to the UK 20 years ago to pursue his passions. In this work, he is trying to link how free trade and the drive to lower prices for companies by Ms. Thatcher as one of the main reasons why his hometown has been on the decline since the early 1990’s. It was a thriving area producing some of the finest leather goods in the world. Over time, thousands of workers lost their jobs as more and more of the production moved to cheaper places like China and Bangladesh. Now the area is only known as producing cheaper clothing and leather goods like the handbags on display. The bags are made of fake leather but are otherwise a perfect copy of the original. Together they are also trying to show how arbitrary we place a value on something. How one handbag can be worth over 25,000 pounds whereas these are worth far less because they are seen as ‘copies.’ The drive to reduce costs has affected many areas including his home. The bags are placed on white cloth to show how the dark square bags affect the purity of the land. The timing of the showing of the piece has been interesting as it was first displayed at the Glasgow Centre for Contemporary Art last June when Britain voted to leave the European Union. Now it is being shown at the Hong Kong Art Basel only four months away from the 20th anniversary of the handover of Hong Kong back to China where Ms. Thatcher was heavily involved in the negotiations between the two countries in the lead-up. Politics is not new for Abad. His father, Butch Abad, was a political activist working for the labour movement during the dark days of the Filipino Dictator Ferdinand Marcos years and was jailed a number of times. Since then, he served as the Secretary of Education and other posts in various governments. His mother, Henedina Abad, is currently a representative in the Philippine Congress. 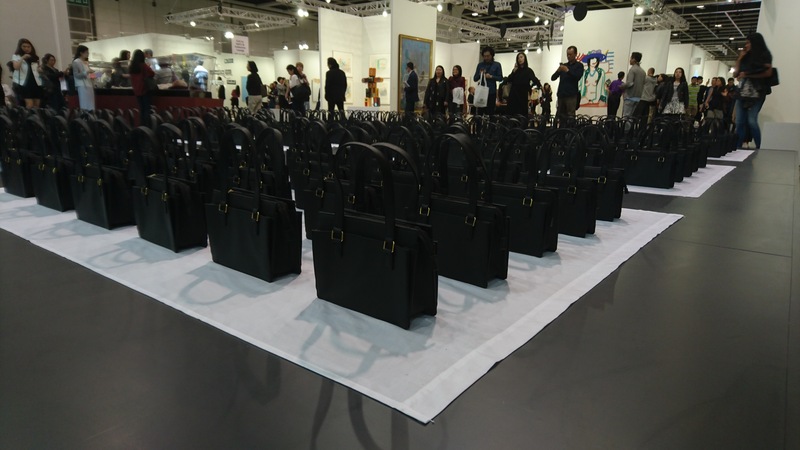 The public was invited to buy the handbags through an on-line auction when they were shown in Glasgow for 250 Pounds each for a total of 25,000 pounds with proceeds going to charities in Marikina. The same amount the original bag was sold. He has another display at the Para Site (22F, King’s Wing Wah Industrial Building, Quarry Bay) from now until June 11, 2017 where his work Soil and Stones, Songs and Souls is on display.